Until the early 1990s, six major drugs existed in the treatment of epilepsy. By 2004, ten new antiepilepsy drugs (AEDs) were made available in the UK. Currently, the available number of AEDs has grown to over 20. There are a number of concerns posed by these medications, ranging from teratogenic concerns to negative impact upon cognitive function to worsening behavior, all which can have an effect upon quality of life of the person with epilepsy (PWE). While treatment guidelines have suggested that the newer AEDs tend to be better tolerated and affect cognitive functioning to a lesser degree than older AED options, the evidence base applied to people with intellectual disability (ID) has not been suitably explored. About 25 % of PWE also have an ID. This group has communication issues, premature mortality, more treatment resistance, difficulties in making informed choices, and greater risks of physical and mental health comorbidities. There is no specific prescribing guidance for this large, heterogeneous, and vulnerable group. Identifying adverse effects to treatment is extremely challenging in PWE with an ID due to the presence of complex comorbidities and often profound communication barriers. This chapter looks to consolidate the current evidence and good practice needed to prescribe specifically in a PWE and ID. It takes into consideration and brings together a wide range of contextual good practice literature from both the ID research world, such as concepts of mental capacity, and the epilepsy world, such as the latest epilepsy medication and drug effects, thus helping straddle the diverse yet fast-developing nature of both the epilepsy and ID scientific worlds. To help present concepts and to highlight clinical complexity, ten case vignettes have been presented. 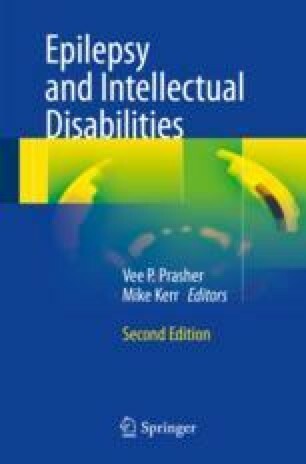 It would be considered an essential read to any clinical practitioner who manages PWE and ID. Indications: Partial and generalized seizures (excluding absence and myoclonic seizures). Main mode of action: Blocks voltage dependent Na channels. Main adverse reactions: Rash, sedation, headache, ataxia, nystagmus, diplopia, tremor, hyponatremia. In practice, cognitive impairment on initiation may be problematic. Drug interactions: Hepatic enzyme inducer, many potential interactions. ID-specific information: Kaski et al. reported a possible increase in efficacy with use of the slow release preparation following a randomized double blind placebo controlled comparison between this and the standard preparation in a learning disabled population. Hyponatremia is frequently reported. Blood monitoring may be of concern in some patients. Indications: Adjunctive therapy for partial and generalized seizures. Short intermittent courses for catamenial epilepsy and special events. Main mode of action: Increases inhibition by GABA. Main adverse reactions: Significant sedation, restlessness, behavioral and cognitive disturbance. Tolerance and withdrawal syndrome. Drug Interactions: Minor interactions only. ID-specific information: No trial data. Hypersalivation may be particularly problematic in the learning disabled. NOT a drug for long term use but value in short (up to 5 day) courses. Main mode of action: Blocks T-type Ca channels. Main adverse reactions: Rash, gastrointestinal disturbances, anorexia, drowsiness, headache. Drug interactions: Levels reduced by enzyme inducing drugs and increased by valproate. ID-specific information: No trial data. Many reports of cognitive and behavioral adverse effects. Indications: Adjunctive treatment in partial and generalized seizures. Main mode of action: Multiple (modifies Ca channels and neurotransmitter release). Main adverse reactions: Weight gain, peripheral edema. Drug interactions: Low potential for interaction. ID-specific information: An add-on comparative open study by Crawford et al. showed no difference between gabapentin and lamotrigine in treatment of partial seizures. Some reports of aggressive behavioral change but generally well tolerated. Indications: Treatment of partial and generalized seizures and Lennox-Gestaut syndrome. Main mode of action: Blocks voltage dependent sodium channels. Main adverse reactions: Rash, insomnia, drowsiness, ataxia, diplopia. Drug interactions: Levels increased when used in conjunction with valproate and decreased with enzyme inducers. ID-specific information: Motte et al. 1997  demonstrated efficacy with minimal side effects in a randomized double blind placebo controlled comparison in Lennox-Gestaut syndrome. An add-on comparative open study by Crawford et al. showed no difference between gabapentin and lamotrigine in treatment of partial seizures. Indications: Monotherapy and adjunctive treatment of partial seizures with and without secondary generalization. Add-on treatment of juvenile myoclonic epilepsy. Main mode of action: Binds to synaptic vesicle protein SV2A. Main adverse reactions: Irritability, insomnia, dizziness. ID-specific information: Kelly et al. 2004  conducted an observational study of adjunctive levetiracetam in a population of learning disabled patients and refractory epilepsy reporting improved seizure control in the majority and suggesting enhanced quality of life from caregivers reports. Indications: Treatment of partial seizures with or without secondary generalization. Main adverse reactions: Rash, dizziness, nausea, somnolence, ataxia, diplopia, hyponatremia. Drug interactions: A less potent hepatic enzyme inducer than carbamazepine. ID-specific information: No trial data. Indications: Treatment of partial or generalized seizures. Main mode of action: Multiple. Main adverse reactions: Rash, drowsiness, impaired concentration and cognition, agitation. Drug interactions: Hepatic enzyme inducer—potential for many interactions. ID-specific information: No trial data. Significant cognitive and behavioral problems reported. Indications: Treatment of partial and generalized seizures (excluding absence and myoclonic seizures). Main adverse reactions: Rash, ataxia, tremor, sedation, gingival hyperplasia, hirsutism. Drug interactions: Hepatic enzyme inducer—many potential interactions. ID-specific information: No trial data. Significant risk of cognitive side effects. Indications: Adjunctive treatment of partial seizures with or without secondary generalization. Main mode of action: calcium channel alpha2delta. Main adverse reactions: weight gain, somnolence. Main adverse reactions: Diarrhea, dizziness, tremor, concentration difficulties. Drug interactions: Enzyme inducers reduce tiagabine levels. Indications: Treatment of partial or generalized seizures. Adjunctive therapy in Lennox-Gestaut syndrome. Main adverse reactions: Somnolence, anorexia, memory impairment, rarely metabolic acidosis and renal calculi. Drug interactions: Hepatic enzyme induction leads to reduced topiramate levels. ID-specific information: A randomized placebo controlled trial in Lennox-Gestaut syndrome showed efficacy in treatment of atonic seizures . Potential for significant adverse cognitive effects and anorexia may be problematic in the learning disabled population. A further randomized controlled trial in adults with ID  failed to show significant seizure change, though the study was underpowered. No change in behavior was seen in this study. Indications: Treatment of partial and generalized seizures. Main adverse reactions: Nausea, dyspepsia, weight gain, tremor, hair loss, drowsiness. Drug interactions: Causes increase in lamotrigine levels when used in combination. Indications: Adjunctive treatment of partial epilepsy with or without secondary generalization. Main adverse reactions: Drowsiness, irritability, weight gain. Drug interactions: May lower phenytoin levels. ID-specific information: Potential for severe visual field restriction and behavioral disturbance severely limits use. Main adverse reactions: Drowsiness, anorexia, irritability, photosensitivity, renal calculi. Drug interactions: Levels increased by enzyme inducing drugs and decreased by valproate. UK Pregnancy and Epilepsy Register. http://www.epilepsyandpregnancy.co.uk/home.htm. Ostler A, Cousins S, Ridsdale L. The causes of death in epilepsy: a systematic review. SUDEP Action. January 2015. Available from: www.sudep.org.